At RSNA 2016, the majority of significant new product announcements were modalities, not information technology. It almost seems that many radiology IT companies (or business segments) are planning to release new product introductions at HIMSS rather than at RSNA. While enterprise imaging remains the core radiology IT technology on display at RSNA, the big buzz this year was artificial intelligence and machine learning. As part of their Opening Session, Keith J. Dreyer, DO, PhD, and Robert M. Wachter, MD, discussed the good and the bad of the digital revolution in radiology. With artificial intelligence (AI) rapidly advancing thanks to events such as the ImageNet Large Scale Visual Recognition Challenge Competition, Dr. Dreyer believes AI will complement radiology and enable radiologists to become leaders in precision medicine; rather than becoming wary of AI, he said, radiology could work with AI to optimize the delivery of patient care. In his presentation, “When Machines Think: Radiology’s Next Frontier,” Dr. Dreyer, Vice Chairman of Radiology Computer and Information Sciences at Massachusetts General Hospital (MGH), said that computer or machine learning can further enhance the reading experience for radiologists. Based on Dr. Dreyer’s experience in opening the MGH Clinical Data Science Center, he sees potential for radiology to be the foundation of precision medicine by utilizing machine learning to tap into the experience and expertise of numerous radiologists when reviewing a patient study. Dr. Wachter, in his presentation, “Hope, Hype and Harm as Medicine Enters the Digital Age: Lesson From and For Radiology,” said that the medical community can learn many lessons from the early digitization of radiology. From the decline of radiology rounds to the change in communication patterns between radiologists and other clinicians, radiologists have become less visible with limited interaction with patients and clinical staff. He sees the same trend occurring at the University of California, San Francisco, where he is Professor and Interim Chair of the Department of Medicine: internists now spend half their day in front of a computer rather than in the hospital wards. With the digitization of the medical record now complete, Dr. Wachter says there are three remaining stages that will continue to transform the delivery of healthcare: connectivity of digital data across institutions, capturing meaningful insights from that data, and then applying those insights into actions that improve the value of the care delivered. Here’s a look at the some of the new technologies released at RSNA 2016. A new module for Advanced Data Systems’ MedicsRIS addresses MACRA/MIPS EMR reporting capability and meets CMS’ requirements for radiologists to avoid MIPS penalties, and to obtain any incentive payments to which they are entitled. According to the company, the capability is specifically designed for radiology in that it presents no impact on radiologists’ workflow. The company also released EMRdirect, which sends finalized reports directly to any referring physician’s EMR without requiring an HL7 interface. Finalized reports, sent as secure messages via Surescripts secure delivery, can also contain links to patients’ images, assuming the PACS vendor makes that capability available. EMRdirect is EMR-agnostic, since all Stage 2 MU-certified EMRs must be able to ingest secure messages. 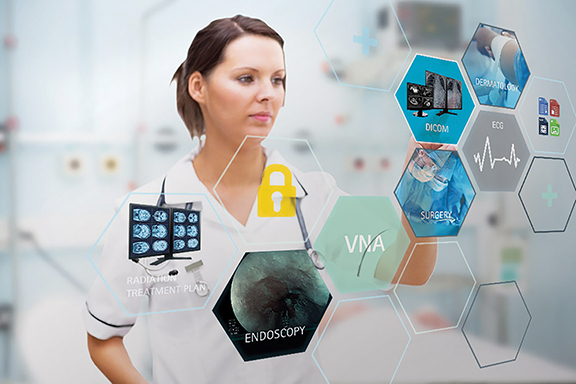 AGFA Healthcare released version 8.1 of the company’s Enterprise Imaging solution, featuring advanced workflow capabilities and intelligent rules embedded in the VNA. Images can be prefetched and prior studies quickly retrieved, enhancing the information available to radiologists and clinicians. The new multisite capability enables patient images to be retrieved from multiple hospitals using a single query. The solution has also been extended into dentistry and ophthalmology, with more information on gross anatomy and pathology to be announced at the 2017 HIMSS meeting. Additional modules were also released to support research and teaching, enabling virtual conferences via a browser using the universal XERO viewer and remote viewing of live cases in the operating room and real-time audio and video consultation. At the heart of Carestream’s Clinical Collaboration Platform is the Unified Core Architecture, which equips customers to mix and match modules within the platform by activating configuration settings that image-enable the EMR, offer a new delivery model using remote care, consolidate archives and support regional image exchange. Users can divide the worklist by specialty or point to different systems within an enterprise through the platforms intelligent engine. The global XDS standard is now available with the ability to assign cases based on specialty or location a WIP. The company also announced a collaboration with Materialise NV to enable web-based 3D printing from STL files via an integration with the Clinical Collaboration Platform. The next-generation of Enterprise-Class DICOM Modality Worklist was previewed by Dicom Systems, providing for the inclusion of visible light image capture devices. The company also demonstrated dermatology and wound-care applications for DICOM Modality Worklist. Utilizing DICOMweb STOW-RS, QIDO-RS and WADO-RS, mobile devices and other secondary capture devices become DMWL nodes like any other imaging modality. The Teremedica Division of FujiFilm Medical Systems USA, Inc, announced the release of Synapse VNA version 6.2, now equipped with robust workflow tools including EPIC’s Haiku and Canto modules mobile application integration with Synapse VNA Connext Mobile which allows seamless, secure capture of point-of-care visible light data in context. For Epic users, diagnostic images and patient visit metadata are automatically passed into Synapse VNA, with no separate launch of the Connext Mobile application required. Images are stored directly to the VNA through Connext Mobile without the need to log into multiple applications or navigate patients outside of Epic. The company also showcased its most recent innovation in Synapse 5: an advanced server-side imaging architecture that provides on-demand access to massive datasets and the ability to immediately interact with the data. 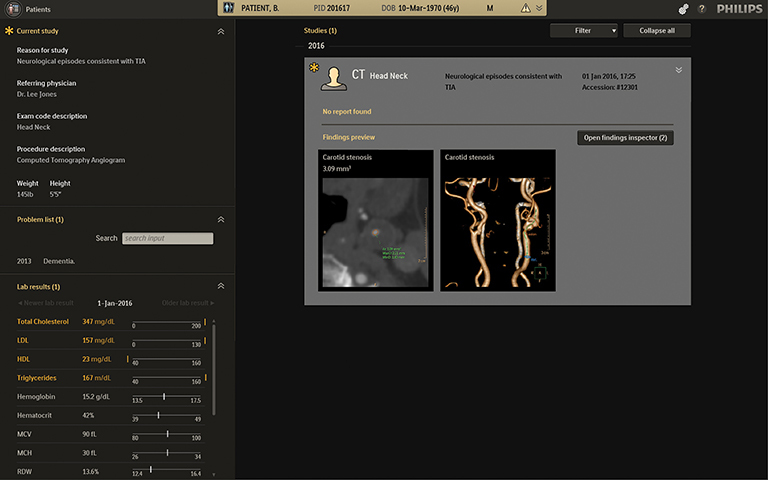 The general availability of the Centricity Imaging Collaboration Suite was announced by GE Healthcare, along with several new features such as development of Integrated Relevant Clinical Content (IRCC) to the Universal Viewer. The suite, built on the secure and scalable GE Health Cloud, enables distributed care teams to view, manipulate and share images beyond their department and beyond their hospital’s walls. IRCC delivers relevant clinical information, including EMR and lab data, radiology reports, patient history and pathology data directly to the radiologist within the existing workflow, using an algorithm that learns as radiologists provide input. Also new to the Enterprise Imaging Solutions portfolio is a comprehensive analytics package for X-ray, Ultrasound, CT, MR, Enterprise Imaging and Cardiology that combines a standardized analytics framework with a ready-to-implement portfolio of analytics applications and consulting services. IBM previewed new imaging solutions from Watson Health and Merge that rely on the company’s decade-long focus on artificial intelligence and machine learning. The tools on display by Watson Health centered around personalized approaches to patient diagnosis and include: a peer review tool designed to help reconcile differences between a patient’s clinical evidence and data in that patient’s electronic health record (EHR); a data summary tool that provides patient specific clinical information to use when interpreting imaging studies; a physician support tool to help doctors personalize decisions based on integrating imaging and other clinical data; and an image review tool, the MedyMatch “Brain Bleed” App, designed to help ER physicians diagnose stroke or brain bleed in trauma patients by identifying relevant evidence in a patient record. Merge showcased Marktation, a process developed to improve image reading accuracy and speed, initially shown for mammography; a lesion segmentation and tracking module for patient conditions that require longitudinal tracking; and a Watson Clinical Integration Module. A highlight in the Konica Minolta Healthcare Americas booth was Exa PACS and Exa Mammo, which is available with full breast tomosynthesis support including BTO slabbing. Users can view digital breast tomosynthesis from any workstation with instant access and zero lag time with the system’s server-side rendering. The Exa-Mammo Viewer is available with the company’s full Exa-Mammo PACS or as a stand-alone viewer that can be integrated with any DICOM PACS. McKesson continued to focus on Conserus Imaging Fellow and announced a new version with McKesson Radiology V.12.3. Conserus Imaging Fellow helps clinicians obtain a more complete view of a patient’s longitudinal record within the context of a diagnostic imaging workflow. It includes tools for summarizing clinical history and collaboration tools for communicating with referring physicians. New to the Conserus Enterprise Viewer is VTrip, which allows the radiologist to navigate in 3D and seamlessly switch to 2D for viewing of individual slices. A new intelligent software, Illumeo, from Royal Philips combines contextual awareness capabilities with advanced data analytics to augment the work of the radiologist. Its built-in intelligence records the radiologists’ preferences and adapts the user interface to assists the clinician by offering tool sets and measurements driven by the understanding of the clinical context. Through its Data Analytics Engine, the software provides the radiologist with the most relevant case-related information from various sources in one single view. This holistic ‘Patient Briefing’ includes the patient problem list (currently a WIP in the US), laboratory results, prior radiology reports, imaging orders or scanned documents (such as handwritten referral letters from GPs and referring specialists) obtained from health information systems like the electronic medical record (EMR) or radiology information systems (RIS). The company also announced IntelliSpace Portal 9.0, also a WIP that includes 510(k) pending applications to track and compare brain images and Longitudinal Brain Imaging (LoBI) for CT brain perfusion and MR T2 perfusion studies. The latest version of the hybrid Cloud PACS, PICOM365.com, is now available from ScImage. It provides an integrated workflow that is fully functional on premises, in the cloud or both. PICOM365.com leverages Microsoft Azure Cloud for security, privacy, scalability and resiliency. Siemens Healthineers showcased the new syngo.via, a software assistant that manages diagnostic findings to make relevant data immediately available. Additionally, syngo.via now brings Cinematic Volume Rendering Technique (Cinematic VRT) to any diagnostic monitor, allowing photorealistic clinical images to be generated from any CT or MRI scan – available to the operator with just one click. Cinematic VRT can be used for communications towards referrers and patients, education, and publication purposes. Providing a single access point for EMR image enablement across multiple PACS, Data Stream from Vital Images enables fast access to the first image and make additional images available as the study loads. Real-time access capability means healthcare providers no longer need to wait for the entire imaging study to transfer before viewing images. 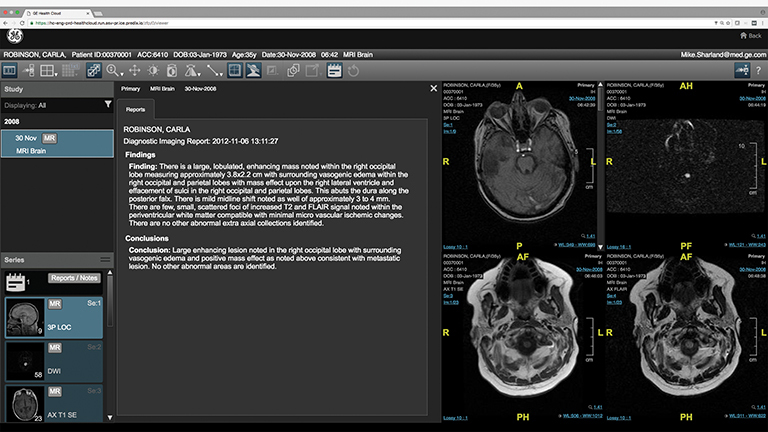 Data Stream converts DICOM to DICOMweb for this real-time capability on DICOMweb viewers such as the company’s Vitrea Enterprise Viewer. Two new features of STATdx, a diagnostic decision support system for radiology from Elsevier, were introduced. Users can now select up to eight different languages to display throughout the user interface and the additional of cine clips will assist users with complex cases and complement the 20,000 patient cases currently contained in STATdx. A new portfolio of clinical decision support products powered by deep learning technology were on display for the first time by medical start-up company Enlitic. The company’s chest X-ray triage product efficiently screens for multiple pathologies to help radiologists find the right diagnoses faster while reducing errors. A lung cancer screening solution, powered by a 3D deep learning engine, detects and characterizes lung nodules, longitudinal monitors findings longitudinally, and automatically generates reports to help enhance sensitivity and scale in lung screening programs while preventing needless biopsies. Medicalis announced the creation of the Imaging Learning Network, designed to help provider organizations meet the requirement and or become qualified provider led entities (QPLEs). The Imaging Learning Network is intended to support both Medicalis’ current and future Decision Support customers, helping develop interventions from the referring physician’s perspective. The Imaging Learning Network’s QPLE members leverage the HMS Library of Evidence scored evidence (which are free and accessible to clinicians worldwide) to create their own certified AUC. Medicalis customers who are not yet prepared to become a QPLE can license certified AUC from Medicalis customers or other QPLEs as laid out by CMS. National Decision Support Company (NDSC) launched CareSelect Imaging, which expands Appropriate Use Criteria (AUC) and indications from multiple qualified Provider Led Entities (qPLE) to cover comprehensive clinical scenarios for diagnostic, cardiac and cancer imaging through a single delivery platform. CareSelect imaging now contains Pediatric AUC and indications published in a joint effort by the Society of Pediatric Radiology and American College of Radiology. CareSelect Imaging also includes a sophisticated calculation engine powered by a rich exchange of data with the EMR. The calculation engine enables new capabilities including the computation of Wells and PERC scores for Pulmonary Embolism and Pediatric Head Trauma based on PECARN (in support of JACHO requirements) and the ability to further inform provider feedback with data such as lab values and pregnancy status when accessing AUC. The company also announced an extension of CareSelect solution beyond imaging, including medication, lab and blood management, as well as a complete set of advisories based on the Choosing Wisely Campaign. The TOTOKU CCL550i2 from JVCKENWOOD now comes with Dynamic Gamma, a technology that automatically recognizes color images and optimizes gamma for the best possible image quality for both digital mammography and color ultrasound. Also, a newly introduced PM Medivisor Cloud enables PACS and IT administrators to remotely calibrate and efficiently manage all TOTOKU displays from any device connected to the network. 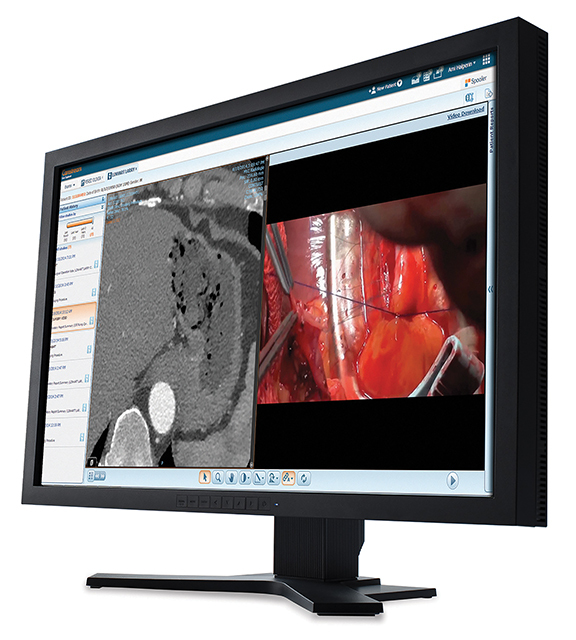 Consumer electronics giant LG entered the medical imaging industry by announcing several clinical and surgical monitors. The LG 8MP Clinical Review Monitor is a 27-inch IPS monitor driving 3840 x 2160 pixels with enhanced brightness levels, wide viewing angles, minimal color shift and accurate images. Dynamic Sync Mode reduces input lag, while Flicker Safe and Reader Mode settings help reduce eye strain experienced by doctors and nurses working long shifts. Visage highlighted Visage 7.1.09 and also previewed Visage 7.1.10 as part of the company’s Enterprise Imaging Platform. Key features include one viewer for all medical imaging, non-DICOM multimedia objects, clinical distribution, EHR integration and other specialty workflows. Using Auto Prior rules and native thin-client advanced visualization tools, Visage 7 displays any combination of current/prior studies, regardless of size or modality. For breast imaging, additional hanging protocol refinements, as well as mammography keypad support, supporting Digital Breast Tomosynthesis, Digital Mammography, Breast MR, Breast US and Automated Whole Breast Ultrasound were released. Mobile barcode and Q/R code scanning capabilities have also been further enhanced, enabling attachment of photos. Massat MB. RSNA 2016 in review: AI, machine learning and technology. Appl Radiol. 2017;46(1):37-41. Mary Beth Massat is a freelance healthcare writer based in Crystal Lake, Il.